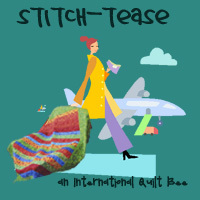 The due date for Challenge 2 of Project Quilting Challenge is upon me! Here I sit (yet again), late Sunday morning, still trying to pry my eyes open, anxiously awaiting the slowest-coffee-pot-in-the-world to finish producing one of the world's most beloved drugs - so that I can get my entry in just under the deadline. Procrastination-station. That is my motto. I admit to being slightly stumped when this challenge was posted last Sunday. I knew immediately what I would use for fabrics, though. A plastic bin full of plaid and striped button-up shirts has been staring at me from the corner of the shop since the end of yard-sale-season last summer/fall. That was about the time I finally came to grips with the fact that these types of store-bought shirts just don't fit a 5'10.5" (and not a decimal taller!!) gal. The waist rides somewhere nearer my bust, and I try to hide the short arms by rolling up the sleeves, but let's be honest: I'm not fooling anybody. So I finally gave in, ridded my closet of those ill-fitting items, and proceeded to buy more at a couple yard-sales with the idea that I'd make something patchy out of them. 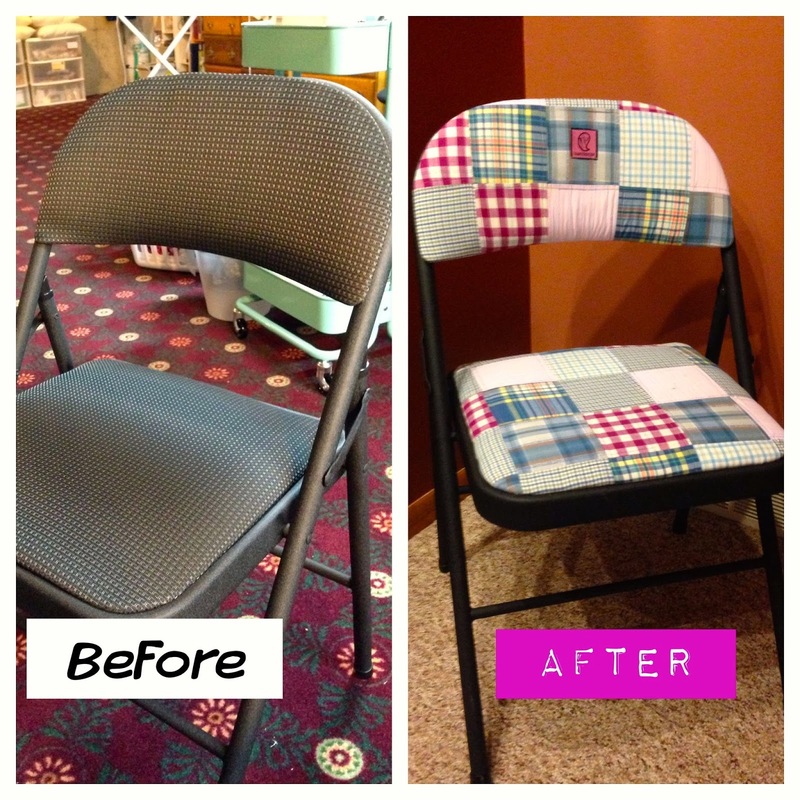 I got the idea to cover the chair cushions from a fellow MadModQuiltGuild member and quilt shop owner, Judy. Her shop, Bungalow Quilting & Yarn in Rippon, WI is adorable. She carries a ton of great modern fabrics. Check it out if you're ever in the area! First I removed the cushions from the chair by taking out the screws in the back. Then I cut the sleeves off of the shirts, because I knew I was only going to use 4.5" squares, so I used the smallest portions of the shirt that would work. 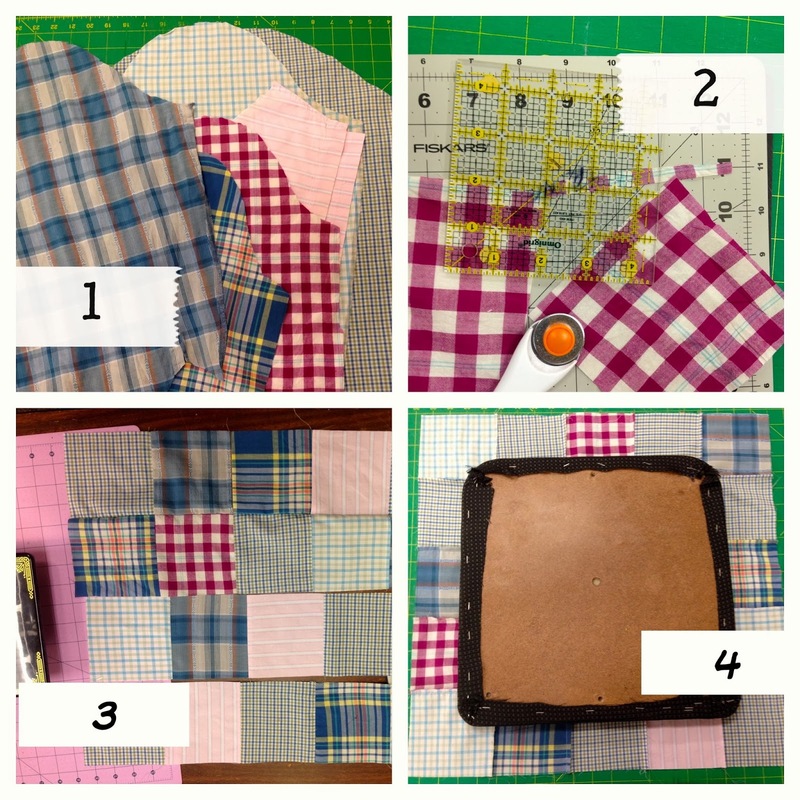 I pressed the sleeves and cut out my squares with my 4.5" square ruler, rotary cutter, and rotating mat. These three tools make the job fast and easy, but they are not absolutely necessary. 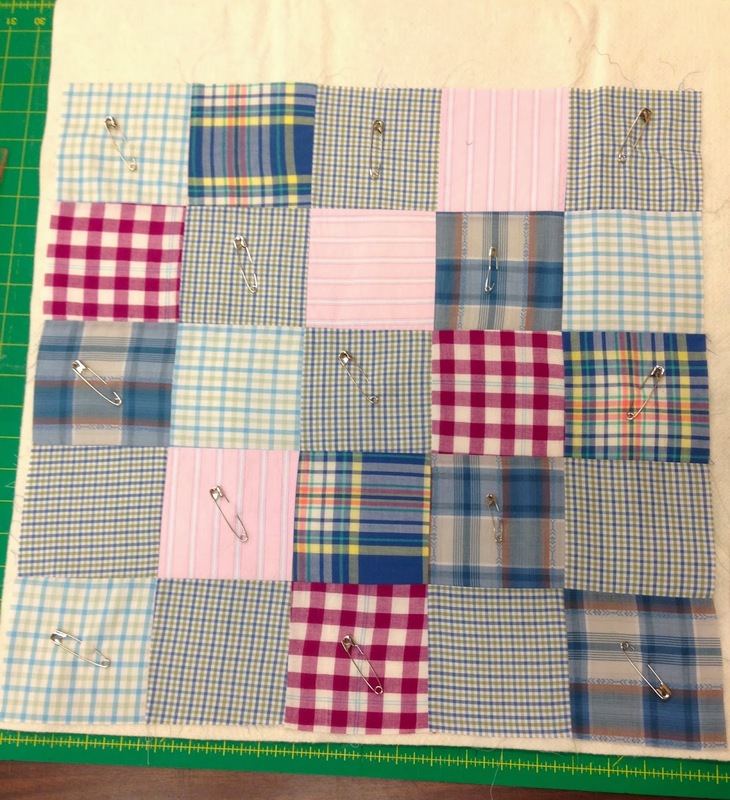 After cutting, I arranged the squares into columns and rows the way I wanted, and then sewed them together. 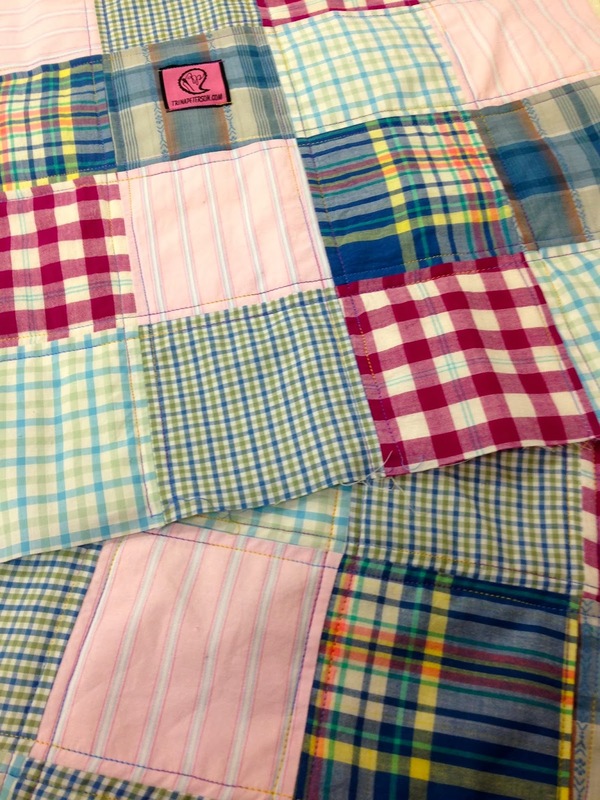 Before quilting, I checked to make sure the patchwork panel was plenty big enough to cover the cushion and to pull back and staple underneath. When the panel was large enough, I used a scrap piece of batting a little larger than the panel, basted with safety pins, and then quilted the panels with 1/4" offset seams. 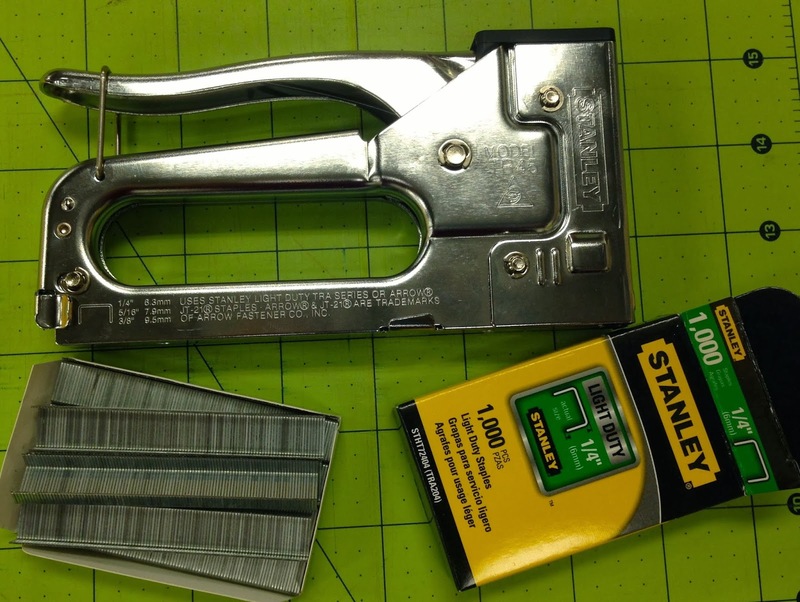 After trimming the excess batting, out came my new favorite tool: the staple gun! I laid out the cushions (right side down) on top of the wrong side (batting) of the panels, pulled the panel edges up over the wrong side of the cushions, and stapled those suckers down. *While doing this step, be careful not to cover the screw-holes on the back of the cushion. 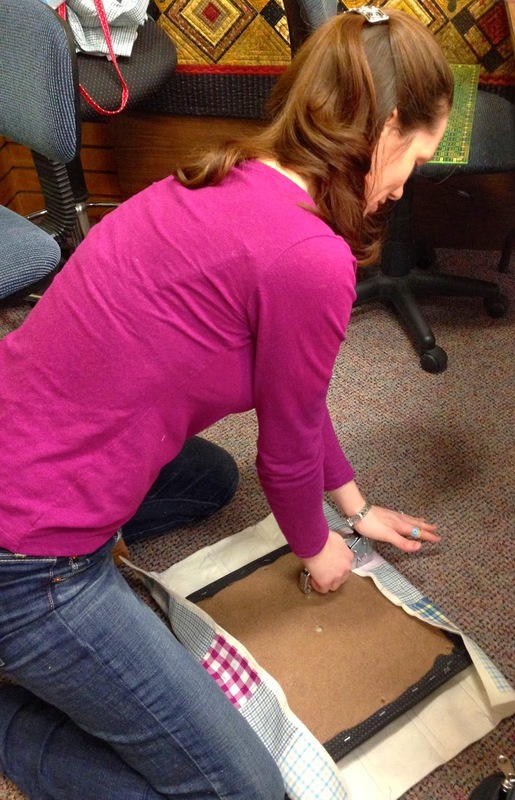 Trim the excess fabric close to the staples, making sure to expose the screw-holes. All that is left to do now is to screw the cushions back onto the chair! You'll notice that I left the old foam and cover on the cushions. This is because I wanted the extra padding. 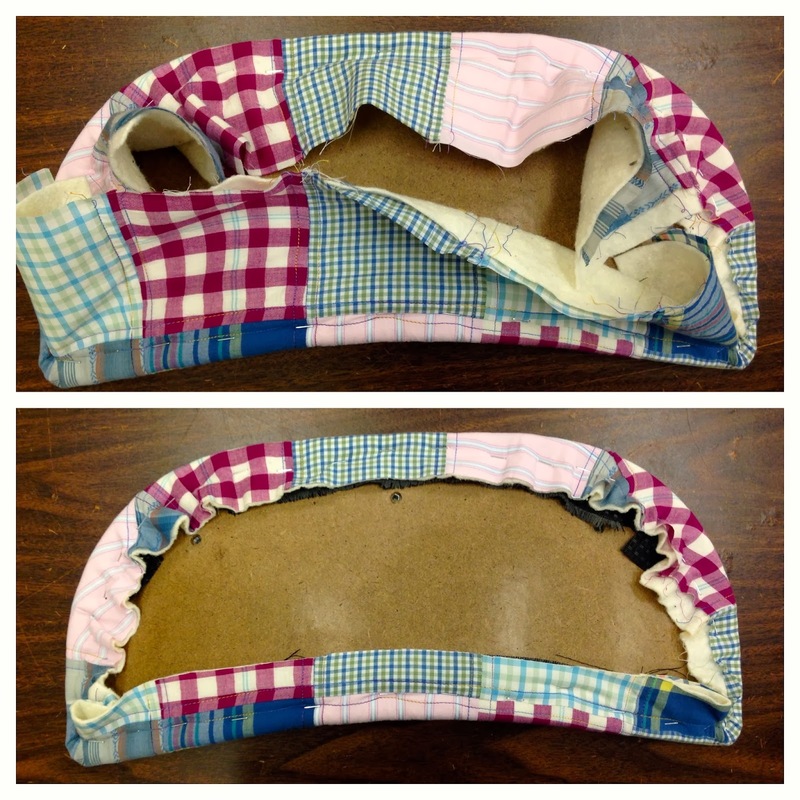 You could remove these (or just the old fabric cover) if you wanted. 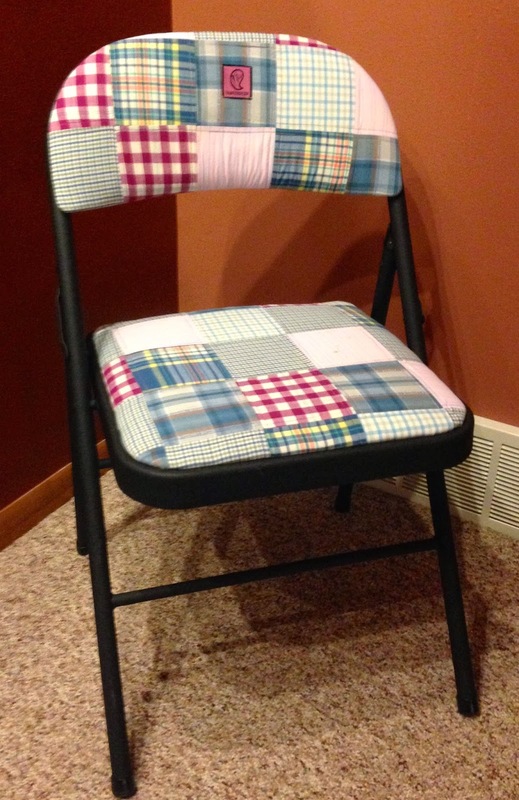 I hope you will check out the Project Quilting Challenge hosted by Kim at Persimon Dreams! It's not too late to join in the fun. The next challenge will be posted on February 2nd. Great job Trina! Can't wait to see you soon! Trina has read 5 books toward her goal of 30 books. Share book reviews and ratings with Trina, and even join a book club on Goodreads. Copyright 2012 Trina Peterson. Simple theme. Powered by Blogger.